Keeping the number of power cords dangling off your desk to a minimum usually means settling for a smaller capacity backup drive that draws all the power it needs from a single USB cable. 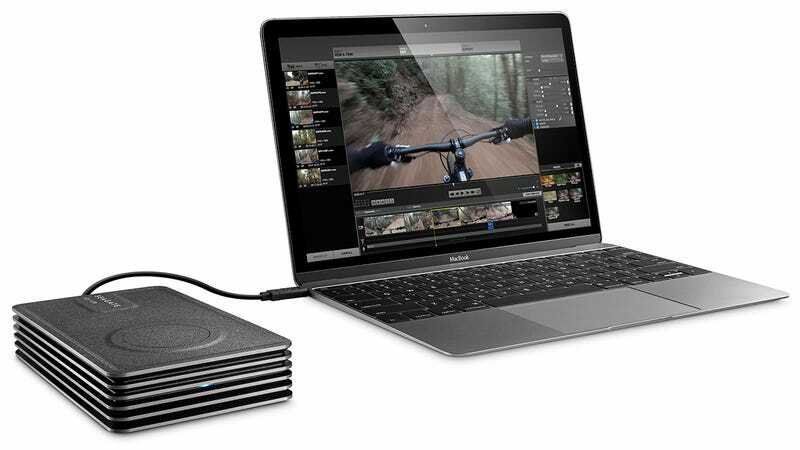 But Seagate’s new Innov8 drive packs 8TB of storage into an external closure that doesn’t need to draw power from an outlet. Available sometime next month for $350, the Innov8 relies only on a USB-C connection to your computer to work. There’s no need to make room on an already crowded power strip for yet another massive wall wart. It’s not just a convenient space saver—it makes the drive far more portable since you can use it without having to first find an available power outlet. Not that it matters too much, but the drive’s enclosure is also easy on the eyes. It looks futuristic and industrial like something you’d yank out of a defeated Terminator while you’re trying to find out what Skynet’s evil plans are.